Human rights are about the best “care and feeding” of human beings. Each species has different requirements. 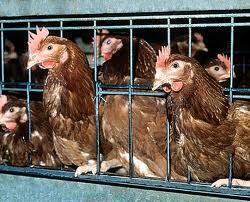 Hens need the freedom to flap their wings and scurry about pecking the ground. Humans need the freedom to say what they believe without fear of punishment. They’re “rights” because you don't have to ask for them or perform duties to get them. Others cannot can take your rights away ― no matter who you are or who they are. They're yours. Here "the public square" is often not defined. This argument can slide from affirming one's right to display religious symbols as an individual to an ostensible right to display them as a state employee. And the appeal to the right to "religious freedom" can also be ambiguous. "Religious freedom" as an important right, or as an absolute that overrides other rights? When people ignore the rights of others who don't wish to live according to the doctrine in question, they are acting in a way that would be rejected by a human rights court. There human rights must be balanced ― your right to religious freedom against mine. And they must also be balanced in terms of other human rights ― your religious rights against my right to obtain legal medical treatment. For instance, conscientious objection was originally permitted to allow people like Quakers to serve as medics instead of soldiers, because they have religious scruples against killing. This kind of conscientious objection is exercised as a human right, since it does not infringe on the rights of others. However, the right to conscientious objection has now been expanded to the point of threatening access to legal medical services like abortion or even contraception of which some religious groups disapprove. Unless there are quick, easy alternatives, the pharmacist who refuses to sell a morning-after pill for reasons of conscience is violating the rights of the desperate woman seeking help. The concept of religious freedom is also being expanded in order to let religious groups mark public space with their symbols and permit their adherents wear non-obligatory religious symbols while in the public service. Thus the Roman Catholic Church is trying to establish “the right to give witness and to live one's faith publicly through visible signs”. That's fine in the private sphere, but someone who is employed by the state has no business putting the public under pressure by “giving witness” on the job. And in the long term if more and more groups start proselytising ― and that includes atheist missionaries ― society can become balkanised along religious lines. You only have to look at the religious parades of Northern Ireland to see where a public show of religion can lead. And it was to prevent any repeat of religious massacres that France developed its strict separation between church and state, including a ban on religious processions which could serve as a provocation. Religious symbols are contentious when displayed in the public sphere. They are seen as territorial marking, like a soldier planting a flag or a dog lifting its leg. 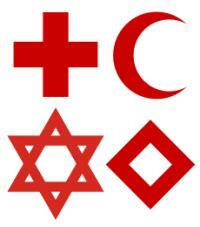 So naturally the symbol of the Red Cross was rejected by Muslim countries, which adopted the Red Crescent, instead. But neither cross nor crescent was acceptable to Israel, which wanted a Red Star of David. However, that was rejected by the Muslims as symbolising Zionism. Finally they all settled on the Red Crystal, a secular symbol that includes everyone. The way to argue against this appeal to unlimited religious freedom is to point out that the religious freedom of one person must be balanced against the rights of others, especially the right to be free of religious coercion. In 2011 a clarification of the Vatican's position on secularism was given by Archbishop Crepaldi. He was asked if there could be a purely political secularism, in other words, was it "possible not to take a position on the problem of God?" His Grace replied, "It is not possible". And he added, "And the secularism that holds it as possible would be deceitful." This sounds like just a rather unpleasant way of saying that either the Church gets its way or the state is anti-Catholic, because a neutral separation is not possible. 3. Religious values can only be fully lived in a society which supports them. The answer to this is simple: "Get thee to a nunnery!" That's what cloisters are for. They're communities of people who wish to live in a society that is run according to their own religious rules. However, what if people protest that they'd rather not withdraw to a cloister and confine the strict religious routine to themselves, but would prefer to remain in this sinful world and tell all their neighbours what to do? Unfortunately, that sounds suspiciously like a power play. 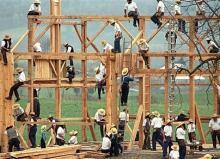 The Amish faced persecution from state churches in past centuries and have retained a principled commitment to the separation of church and state. They even refuse money from the government, both as individuals and as a group, although they pay taxes. By contrast, some atheist Humanist groups eagerly vie for government grants. ♦ Spanish Catholics at the same time were urged to support the rebellion of General Franco against the Second Spanish Republic. ♦ In World War II Catholics serving in both of the warring factions were assured that they were fighting a just war. This is an attempt to do an end-run around church-state separation. Christianity is claimed to be exempt from any restrictions imposed upon other religions because it's part of "European cultural identity". This favourite papal notion can lead to hilarious historical contortions. In Regensburg , Benedict [stated] that Christianity took on "its historically decisive character in Europe" despite "its origins and some significant developments in the East". 7. (My brand of) religion must run society or God will punish us all. This is the old divine-wrath argument against church-state separation. It shocks even many believers to assert that God chooses wholesale punishment of innocent people for the sins of a few. 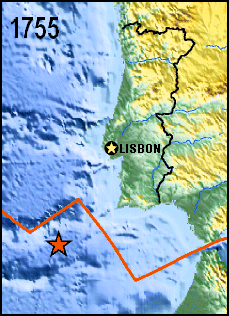 It was first ridiculed by Voltaire in response to the clerics' claim that the Lisbon earthquake of 1755 was caused by the city's sinfulness. More than three centuries later this argument is still being used against secularism. It comes in two variants (which are often combined). First, if God punishes the unconverted, then missionising becomes a duty to them and, second, if divine wrath is visited on everyone, then "sin" must be rooted out of the whole society. Of course, a less charitable interpretation would be that this argument amounts to: "Do what I say, or my Powerful Friend will get you!" Targeting gays lets unelected clerics maintain their authority by posing as champions against "sinister forces". A small and harmless minority is demonised and proclaimed a threat to society. Fear of God's wrath can be used to suspend fundamental freedoms and effectively place society under emergency laws. But while a genuine security threat only prompts temporary measures like martial law, this manufactured "moral emergency" is seen as permanent. The laws brought in to enforce to religious doctrines are meant to be forever. 5. Guenter Lewy, The Catholic Church and Nazi Germany, 1964. See also "Papal permission to convert by force and enslave pagans", Concordat Watch. 6. Robert Fisk, "Pope will demean other religions to prove Christianity’s ‘superiority’", Belfast Telegraph, 28 February 2009. After the earthquake which had destroyed three-quarters of the city of Lisbon, the sages of that country could think of no means more effectual to preserve the kingdom from utter ruin, than to entertain the people with an auto-da-fé, it having been decided by the University of Coimbra that burning a few people alive by a slow fire, and with great ceremony, is an infallible secret to prevent earthquakes. 11. "Almost half of Roman Catholics in England and Wales no longer feel obliged to confess their sins, a new survey claims."